In the winter of 1988, I arrived in New York with more enthusiasm than good sense—and no journalism experience—hoping to become a writer. Although only an intern at The Nation, I was casting around for people I might eventually profile. One such character was a brilliant autodidact, who happened to live in the apartment one floor below mine. “That sounds like Joe Mitchell’s pieces about Joe Gould,” a friend of mine commented when I mentioned the idea. The blank look on my face betrayed the fact that I hadn’t heard of either. “You want to be a writer and you don’t even know who Joseph Mitchell is?” he said, voice dripping with scorn. Humiliated, I did some research and discovered that Mitchell’s last published article, “Joe Gould’s Secret”—about the Village eccentric also known as Professor Seagull, who claimed to be the author of the longest book ever written, the (entirely imaginary) Oral History of Our Time—had appeared in The New Yorker in 1964, a year after I was born. There were no paperback editions of Mitchell’s four collections, and the hardcovers were long out of print, fetching steep prices in secondhand bookstores, if you could find them at all. I also discovered an old photograph of Mitchell, and learned that he lived with his wife and daughters in a modest apartment building on West 10th Street. It wasn’t long before I spotted him strolling down lower Fifth Avenue, wearing his signature three-piece Brooks Brothers suit, freshly polished shoes, and a fedora. I still hadn’t read anything by him, but at least I knew who he was. According to Thomas Kunkel’s biography, Man in Profile, I wasn’t alone. By the late ’80s, Mitchell “had come to grasp the dreadful irony: If he was known by a modern audience at all, it was for not writing.” A Mitchell renaissance began in 1992, when Pantheon Books published Up in the Old Hotel, his collected New Yorker nonfiction, which spent several weeks on the bestseller list and still sells steadily in paperback. A new generation of readers discovered Mitchell (Born Again was the title he suggested for the collection), and interest in his work continued to grow after he died from lung cancer in 1996, at the age of 87, the year Joe Gould’s Secret was reissued as a stand-alone volume. A charming movie version of it, starring Stanley Tucci as Mitchell and Hope Davis as his wife Therese, appeared in 2000. Joseph Mitchell lays down sentences the way a master brick-layer builds a wall: deliberately, one increment at a time, allowing each row sufficient time to set. The New Yorker was America’s first urban magazine. It was founded by Harold Ross (the subject of Kunkel’s previous book), the son of a Colorado silver miner and a schoolteacher. Ross was a high-school dropout who became a reporter in New York, where he had an idea for a magazine directed at novice metropolitans like himself. It would be a “reflection in word and picture of metropolitan life,” according to the 1924 prospectus. His insight was less demographic than aspirational. “You cannot keep The New Yorker out of the hands of New York–minded people, wherever they are,” announced a promotion for the magazine. “New York is not a tack on a map, not a city, not an island nor an evening at ’21.’ The New Yorker is a mood, a point of view.” And like The New Yorker‘s readers, most of its writers and editors came from elsewhere. “That very ‘otherness’ was key to The New Yorker‘s freshness and inventiveness, in that all those creative people were exploring their curiosity about New York within the magazine itself,” Kunkel writes. While at college, Mitchell composed fictional versions of the “field sketches” for which he would later become famous. When an article he wrote about tobacco farming was published in the New York Herald Tribune, he decided to go to New York and try his hand at journalism. He received no encouragement from his father, who asked him, “Son, is that the best you can do, sticking your nose into other people’s business?” Mitchell would spend the rest of his life shuttling between New York and Fairmont, a self-described “exile,” consumed by guilt for leaving home and disappointing his father. Mitchell arrived in New York in time for the 1929 crash, an experience that added to his psychological baggage. “Looking back on it, I think I got scared during the Depression and never got unscared,” he wrote in an unpublished memoir. New York had more than a dozen daily newspapers at the time, and Mitchell got a copyboy job at The World, soon working his way up to a reporter’s position at the Herald Tribune and, finally, the World-Telegram, writing dozens of celebrity profiles of people like Eleanor Roosevelt, Kitty Carlisle, Jimmy Durante, and Tallulah Bankhead. It wasn’t long before Mitchell had become a marquee name, his stories regularly published on the front page, his picture featured on World-Telegram delivery trucks. Mitchell’s literary journalism grew out of the work by late-19th-century muckrakers and novelists like Crane, Jacob Riis, and Lincoln Steffens. Crane, for one, thought nothing of chronicling the same incident in different genres, as he did when he wrote about being shipwrecked in a newspaper article, a short story, and a magazine piece. 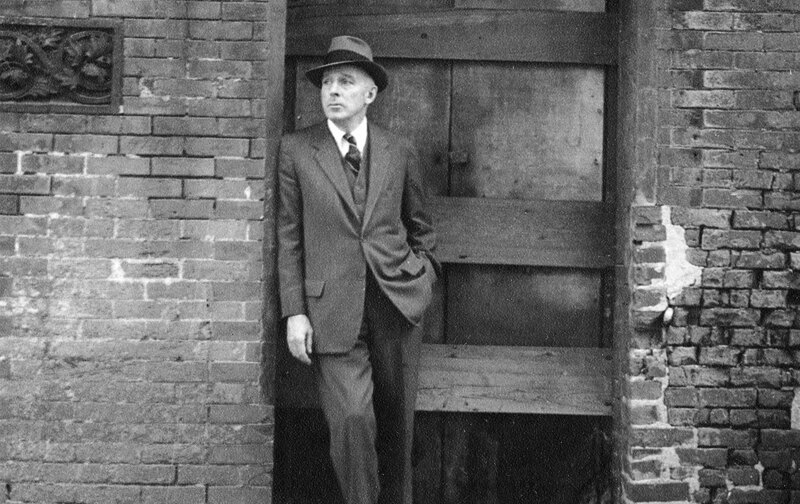 Crane used his novelist’s sensibility to render New York as a “mosaic of little worlds.” The historian Alan Trachtenberg wrote that while crusading journalists sought to convert “the reader to social sympathy,” Crane strove to turn “the sheer data into experience.” Taking his cue from Crane, Mitchell became a gifted listener who rendered the people in his stories with novelistic detail. “Mitchell coaxed his subjects with a great and animated enthusiasm, as if the secret to happiness or the meaning of life could be found in their sometimes-dreary monologues,” Kunkel writes. Gettting hired by The New Yorker was both the best and the worst thing that happened to Joseph Mitchell. Mitchell thrived at the World-Telegram, but his work wasn’t dramatically different from his colleagues’. That changed in November 1937, when he was assigned a six-part series on Franz Boas, the German-born Columbia professor of anthropology. The encounter was a “graduate-level seminar in anthropology that caused him to rethink, as a reporter, why people are who they are and do what they do,” notes Kunkel. As the interview proceeded, Mitchell realized that Boas was studying him, “a newspaper reporter,” much as an anthropologist might observe a member of a newly discovered tribe. Harold Ross hired Mitchell in 1938, assuming he’d get stories similar to those that had been appearing in the World-Telegram. In a sense, he was right, in that several of the people Mitchell had written about for the newspaper appeared in his early New Yorker stories as well. However, the encounter with Boas had altered his view of the world. “I began to see that I had written a lot of things that were highly dubious,” he recalled. She is known as “Miss Mazie” by the blighted men who exist in the walk-up hotels along the Bowery. Her real name is Mazie Gordon, and she is a blonde with a heart of gold. Her clothing is flamboyant, and she uses cosmetics with abandon. This is the Mitchell who inspired generations of writers by showing us how to observe something or someone without preconceptions, as if for the first time. In his hands, the intrepid urban reporter, simply by describing the scene with an air of sincere wonder, provides an oasis of ingenuousness in an all-too-knowing culture. Getting hired by The New Yorker was both the best and the worst thing that happened to Mitchell. In order to provide its writers with something akin to a steady salary, the magazine had an unorthodox compensation plan according to which writers would draw money against future earnings, a system that left many of them working as indentured servants for years. The idea of being in debt so terrified Mitchell that he became the sole staff writer with a conventional salary, starting at $100 per week. At first, Mitchell maintained his World-Telegram level of productivity, publishing 13 pieces in 1939, half of which were fiction. Three of the pieces that made his reputation—”Lady Olga,” “Mazie,” and “The Old House at Home”—appeared in 1940. He began to slow down in the 1950s, publishing only five stories. With his newfound sense of vocation, Mitchell spent more time reporting each of his stories. He began to suffer from depression, and with his small but regular New Yorker salary and revenue from the farm, there was little external pressure on him to produce. Everyone acknowledged that his work was getting even better, and some of his most probing, profound pieces appeared between 1950 and 1964, introducing the world to such memorable characters as Louis Morino, the owner of Mitchell’s favorite seafood restaurant, Sloppy Louie’s; Old Mr. Flood, the 95-year-old retired house wrecker who lived on a diet of fresh seafood, harbor air, and the occasional Scotch; George Henry Hunter, the chairman of the board of trustees of the African Methodist Church in Sandy Ground, Staten Island. Today, the two most commonly asked questions about Joseph Mitchell are whether he made things up and why he stopped publishing. The last sentence was probably unnecessary. No one doubted Mitchell’s reporting acumen, but when book publishers and admirers were unable to find some of his characters, it raised questions about the existence of the rest. Part of the magic of Mitchell’s writings had always been the way that he inhabited his characters (he assigned Mr. Flood his own birthday, July 27; both ate little other than seafood), imbuing them with the wisdom, perspective, and knowledge that he possessed. But after he confessed to having created some of his characters, the long, seductive quotes attributed to others seemed suspicious. The New Yorker had published composite characters before, especially in its early days, when Ross thought of the magazine as more humorous than serious. Kunkel discovers that, according to Mitchell, it was Ross who suggested that he bring his beloved Fulton Fish Market characters to life in a composite—so, unlike more recent fabulists, such as Stephen Glass and Jayson Blair, the writer had the boss’s permission. And Mitchell feared that readers would conclude that all his characters were composites, which is why he added the note to the Mr. Flood collection. Today, composites are forbidden in all respectable publications, and there are journalism professors who won’t teach Mitchell. I think it makes more sense to think of Mitchell as an heir to Crane—a 19th-century man living in a 20th-century world. The family business required that Mitchell spend more time in Fairmont in the 1970s and ’80s, but he continued to show up at his New Yorker office every morning when he was in town. Staffers would hear him typing away in his office, and their fascination reached the point where some would rummage through Mitchell’s trash can at the end of the day, in search of manuscript pages. Oddly, the standard answer to the question of why Mitchell stopped writing—that he was Joe Gould—was suggested by Stanley Edgar Hyman way back in 1965: “We realize that Gould has been Mitchell all along, a misfit in a community of traditional occupations, statuses, and roles, come to New York to express his special identity.” And Mitchell spoke freely about his relationship to Gould in a 1988 interview with the scholar Norman Sims. “To me a very tragic thing [about the Joe Gould profiles] is the story of so many people who bit off more than they could chew—and I’m one of them, you know…. Because he is me.” The difference between Mitchell and Gould, of course, is that the former died with a substantial body of work in which the latter exists only as a character.